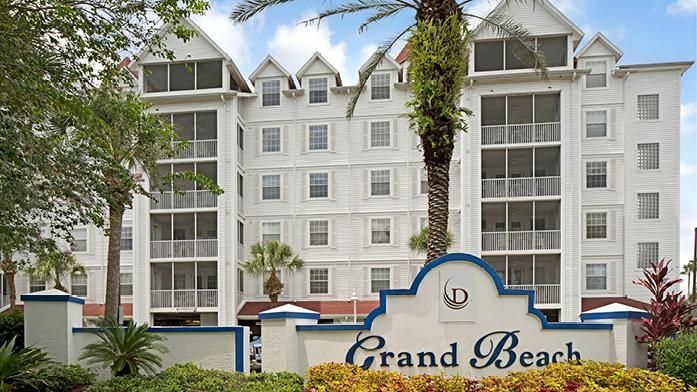 The ultimate family vacation destination, Grand Beach in Orlando is just minutes from Florida’s Walt Disney World, SeaWorld, Universal Studios and endless designer outlet malls. Enjoy the amenities of this quiet lakefront getaway where you can take a dip in the outdoor pools, relax in the whirlpool or enjoy fishing, canoeing and other water sports on Little Lake Bryan. Select from over 5,180 restaurants, 168 golf courses, 52 million square feet of retail shopping and 95 unforgettable attractions. Exhilarate at theme park thrills, shopping delights and culinary discoveries including lavish buffets, international cuisine and spectacular dinner theaters. Play in the great outdoors with a round of golf or a game of tennis. Meander along the nature trail boardwalks. Discover incredible bargains at outlet malls, and beautiful treasures at local shops and boutiques. Switch gears from a land-based safari and explore underwater life at SeaWorld. Play all day – and night – at Universal Orlando, Disney, and CityWalk (all under 15 minutes away!) or just laze by the pool and recharge your spirit. Whether you’re looking for a Disney getaway with the family, a romantic couple’s retreat into the magic of Epcot and the gorgeous Florida scenery, or a solo trip to the non-stop excitement and beautiful weather of Orlando, the family-friendly Grand Beach Resort- with its spacious rooms, wonderful on-site amenities, and perfect location- will make your dream vacation a reality. We are the official and exclusive partner for Diamond Resorts. Only rent from official listings in order to ensure your reservation gets delivered to the resort and you receive the best possible guest experience at our properties. This resort holds a TripAdvisor Certificate of Excellence for consistently favorable guest reviews. Just off of Highway 192, the beautiful Grand Beach Resort offers easy access to fine dining, outdoor and retail shopping, golf courses, and all the best Orlando attractions and theme parks. Walt Disney World is just down the road and Universal Studios, Wet N’ Wild Waterpark, and SeaWorld are all under twenty minutes away. Orlando International Airport is only 25 minutes northeast, so travel is easy as can be. Golf lovers will appreciate the close proximity to some of Central Florida’s best courses, with Mystic Dunes, Celebration Golf Club, and the Orange County National Course less than 15 minutes away and Hawk’s Landing Golf Club just across the street! Daytona Beach and Cocoa Beach are less than an hour’s drive away, and Central Florida fun such as swimming with dolphins at Discovery Cove, riding hot air balloons, ziplining and riding horseback, swimming in crystal clear lakes while admiring the gorgeous wetland scenery, Battling Darth Vader at Disney or taking the Hogwarts Express is all at the tips of your fingers. This Two-Bedroom accommodation is a sprawling 1092 sq. ft. and can house up to 6 guests. The Master bedroom features a plush king-sized bed alongside a luxurious whirlpool tub and the guest bedroom contains a pair of cozy twins. Two full baths, a screened patio, two televisions with cable, and a DVD player are some of the key features of this beautiful home. Best of all, all two-bedroom accommodations feature a full kitchen equipped with a microwave oven, coffee maker, icemaker, fridge, stove and oven, toaster, dishwasher, dishes and utensils. A washer and dryer as well as a queen sleeper sofa are included for guests' convenience. This beautiful resort boasts far more than a five-star location: sports courts, massage services, mini-golf and a putting green, a fully-equipped fitness center, a comprehensive Activities Program and much more. Little Lake Bryan offers boundless outdoors excitement with opportunities for kayaking, canoeing, fishing, and beach lounging. Enjoy the resort’s outdoor heated pool, children’s pool, and luxurious hot tub after a long day at Walt Disney World. Head over to the BBQ area for an afternoon grilling session with your friends and family or enjoy a light meal together in the Picnic Area. Shuffleboard, Tennis, Basketball, staff-led games, mini-golf, fishing and water sports, this resort has everything you need to have fun! Very impressed with the grounds, cleanliness and overall quality of the facility. We are so happy to hear that you enjoyed your stay with us. The on-site team work hard to deliver an exceptional guest experience and appreciate your comments. We welcome the opportunity to host you again the next time you are in town. Great price for a 2 bedroom condo that got upgraded to 3. Nice relaxing place close to all Disney parks. It’s a time share but attending the presentation is optional and they only ask you once at check in. Apartment has everything you need, very clean and nicely decorated. Pool and hot tub were nice. Staff was nice and friendly. Would definitely book again if going to Orlando. Thank you for taking the time to share your comments about your recent stay. We work hard to make our guests happy and appreciate your feedback!. All of our team members look forward to welcoming you back to Grand Beach in the future. Very nice, spacious. We had a 3br condo for 6 Stayed for 5 nights and never felt crowded. The building was under renovation n but can't say it really bothered us. Lots of activities around. The staff was really friendly. Rooms were nice but there is nothing around! The rooms were nice. The only downfall is there is no cafe, restaurants, or even a small bar for cocktails. Pack your food and drinks if you stay here. Great place 10min away from all the parks. Traffic is a bit crazy at times. It is a time share so they try to get you to go to a 2hr timeshare meeting. Once I checked in and got to the unit they never tried to bother me again. Defiantly will stay again. The suite we stayed in was amazing and the resort was beautiful! We I’ll stay there again! OTHER THINGS TO KNOW - ­­­­­­Check in Time: 4 pm - Check Out Time: 10 am - Minimum age requirement for check-in is 21 years of age. - All Guest Suites are Non-Smoking - Pets are not permitted and strictly enforced with the exception of Service Animals. TAXES AND FEES: - A photo ID, credit card for $100 security deposit and a nightly rate of $14.95 plus tax Resort Fee will be required at check-in. (cash is not an acceptable form of deposit). - Resort Fee includes pools and hot tubs, poolside movies, fitness room, business center computer and boarding pass printing. This property charges a mandatory resort fee due at check-in. Please check listings for details. Rates subject to change. Click "Book it Now" for rates and availability. Reservations may be cancelled up to 8 days prior to arrival. A cancellation fee of 25% of the reservation will be charged. Cancellation requests made 7 days or less prior to arrival are non-refundable.